The carnival parade assembles in Pound Street before it sets off at 2pm along Bartholomew Street, Northbrook Street and then turns right at the clock-tower roundabout into London Road and then right again into Parkway where the parade ends. Parade vehicles have a dispensation to exit Parkway via the bridge. By prior arrangement, some parade entries will continue along London Road to enter Victoria Park via St Mary’s Road. 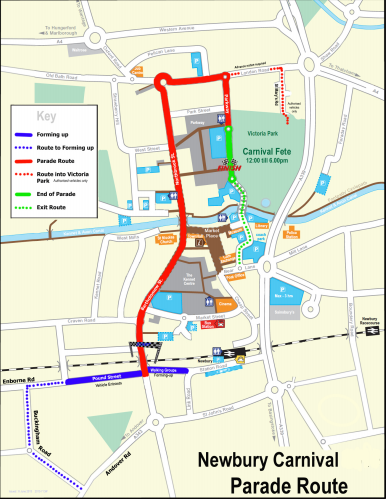 Both the parade route and Victoria park are within a short walk of the railway and bus stations: see map. Car parks are shown in light blue. Click here for further information about parking and charges from West Berkshire Council’s website and here for the Visit Newbury website which provides detailed information about visiting Newbury. You might also find this Parkopedia page useful. Please note that we cannot guarantee the accuracy of any external website. Pound Street and Enbourne Road (From Pound Street to Enbourne Grove) will be closed from 12:30 to 2:30pm to allow the parade to form up. Traffic from Rockingham Road will be diverted via Enborne Road to Buckingham Road. From 2:30pm to 4pm there will be a rolling closure through the town to allow the parade to pass and then disperse. The route will be Bartholomew Street, Bridge Street, Northbrook Street, Broadway, London Road and Park Way. Most of the route is in the pedestrianised area however London Road will be congested or closed for some time and traffic from Robinhood Roundabout is advised to divert westbound along the A4 Western Avenue. Park Way will be closed for a considerable time whilst the floats unload and disperse, during this time buses and taxi’s will be diverted via Bear lane and the A339.